(CNN) - Word of Republican Sen. Marco Rubio's trip to Iowa next weekend has many people who cover campaign politics buzzing. The popular freshman senator from Florida will headline a birthday fundraiser for Terry Branstad, the Hawkeye State's GOP governor. Since Iowa holds the first contest in the caucus and primary calendar, Thursday's announcement is stirring talk of a possible bid for the 2016 Republican presidential nomination. But is such talk premature? "I think it's way too soon to talk about 2016 implications, beyond the obvious fact that it never hurts to have friends in Iowa. This will likely be a quick trip just for the dinner, and he doesn't have any other travel planned," a source close to the senator told CNN. So how did the invitation come about? The source says "Gov. Branstad ran into Sen. Rubio at the Republican convention in Tampa and asked him to headline the annual dinner. We made sure it would work on his schedule, and then accepted the invite." 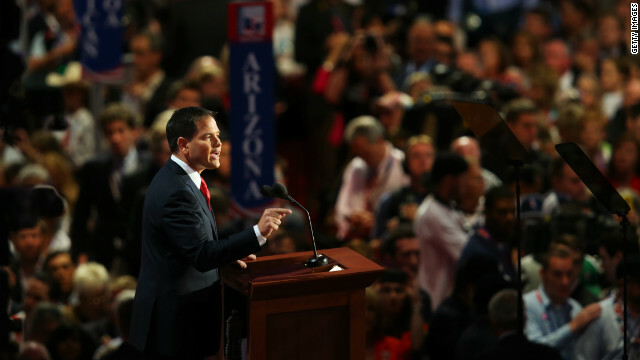 Rubio is considered a rising star in the party, he was a top surrogate for Republican nominee Mitt Romney, and his name was in the mix as Romney's running mate. As for the event, what a difference a year makes. At last year's fundraiser, which came during the height of the battle for GOP nomination and just weeks before the Iowa caucuses, six of the Republican presidential hopefuls had speaking slots, with the exception of eventual nominee Mitt Romney. Former House Speaker Newt Gingrich showed up late to the event, and did not give remarks. Does anyone out there actually believe that black voters would vote in large numbers for an Allen West over a Democrat who was white? Republicans seem to think that of Latinos and Rubio. Shallow minds lead to shallow ideas. So now that the Party of Old White Hate (GOP) thinks if they find a non-white person to spew out their outdated evil rhetoric; it somehow is no longer the outdated evil rhetoric of the Party of Old White Hate? It’s not the messenger. It’s the message. And I hope the GOP keeps their message because the nation wins whenever they lose.